" . . . what a strange lesson in geography i was given! . . . he spoke of orange-trees on the edge of town: "beware of those trees. better mark them on the map." and those three orange-trees seemed to me higher than the sierra nevada . . . "careful of that brook; it breaks up the whole field. mark it on your map." all those things we think unimportant, all those small moments of which we take no notice. all necessary, all part of our map. the maggie road ends in wild clover blossoms under an oak tree. i mark it. 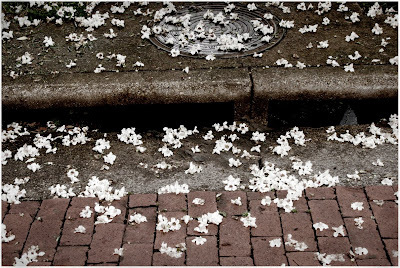 i mark the falling of these catawba blossoms; they signal spring and also the beginning of the road into summer. a new summer, a different summer in too many ways to count, a new summer road. i make an x. i begin the walk down that road, my heart-compass leading me, mapping new roads, new stars, paying closer than ever attention to the details already there. i am adding baby owls, they have been on my map for years, but these are new babies, so new marks. a blue flower drawn on the map, marking the day of blue flowers, a basket awaiting me on the doorstep, comfort from a friend the day after maggie's death. it will be a soft map for a bit, though the road has been hard; the summer heat will soften that. "my heart compass" i love that ! Your words are always so beautiful, and they comfort me. Thank you for that. I also so love taking this view of my own life...I will be holding this close to me. we are an unfinished map, plenty of room for new adventures and small treasures to be buried . . .
this is wonderful, it makes me think of a map drawn in the sand, ever changeable, able to be erased by a strong wind. but you can always redraw it and add new things or change your path, or leave it and start a whole new map in a different spot. and your compass always knows the way, even when you don't. 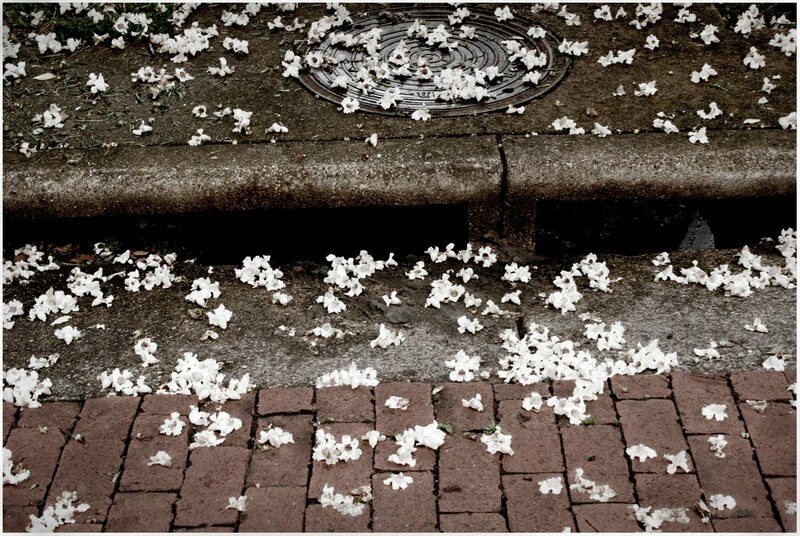 How I love fallen blossoms and the words you use to describe them. Love how you notice the "small things" which are really not so small at all. sigh. how beautifully captured. thank you. you are very kind to share this masterful imagery of your map. And you, adding points of beauty to our own maps. For our lives are maps, and the journey is marked with blissful meetings and comings and goings and Debi you have marked my map today with this post. I love your writing...you weave such beautiful words. Sorry for the loss of your cat...pets are so hard to loose. On my own map I am adding cameras and long walks and hammocks and a long, lazy summer. Oh, isn't it so very true? Blossoms do urge us to pay attention to this moment that will soon be gone. What is it about spring? No other season seems to pass by so quickly. Every spring, I wish for it to linger a little bit longer.